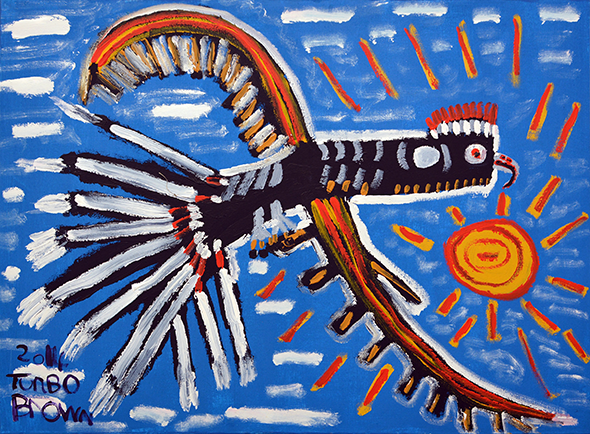 There are many Indigenous artists who would be classified as Naïve artists in an international context. However there are some white administrators who would resist such a classification, feeling it should be seen solely as Aboriginal art rather than tied in with an international genre. Nonetheless, the works of this style qualify on the world stage as Naïve works as they represent the day to day life of Australian Indigenous peoples and are executed in an innocent and untrained style. 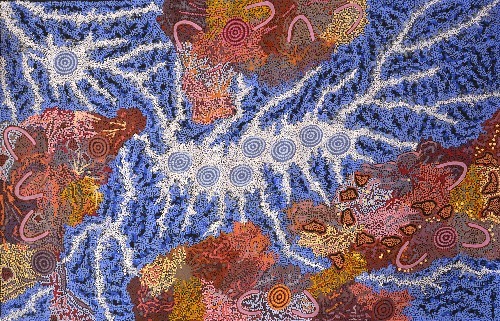 Naïve Indigenous art is a fascinating study: the changes in Aboriginal life, their interface with the 'whitefeller' ways, and their experience through this period of change in particular are highlighted by some of these delightful works. Linda Syddick’s ‘Windmill’ artworks are a brilliant representation of ‘first contact’. 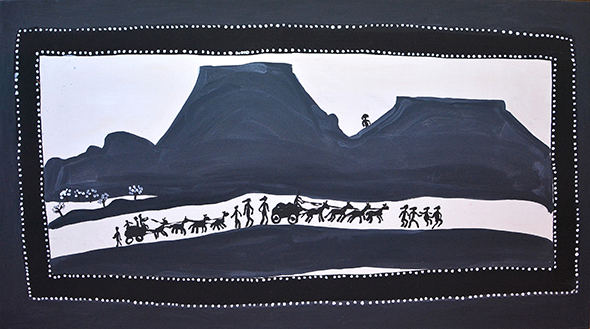 And Jack Dale’s artworks tell his incredible life story, sometimes revealing the hidden past of Australia’s frontier. Despite the sometimes grim subject matter, there is an enchanting and buoyant spirit in his art, just as there was in this resilient man. While Trevor ‘Turbo’ Brown’s artworks transport you to his ‘dreamtime’ where all of his quirky critters live in unspoiled harmony. While his work may seem naïve in the simplicity of form, there is an incredible energy in the dynamic composition, colour and line. 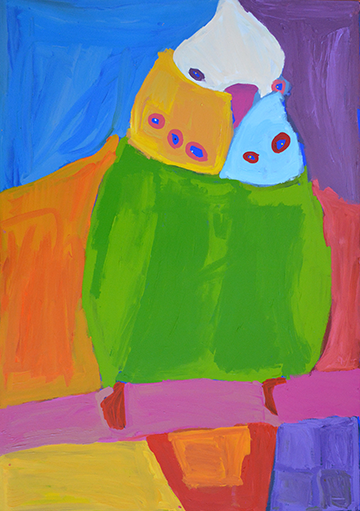 It could be said that Karen Napaljarri Barnes’ composition is quite simplistic; lozenge-like shapes in bold, contrasting colours. And yet her quizzical critters convey so much expression, each creature with its own unique personality, making her work incredibly appealing and memorable. Because they express what is happening now, and Aboriginal life as a part of what is happening, they will be collectors' items of the future, cataloguing as they do, the political social arena in which we now live. 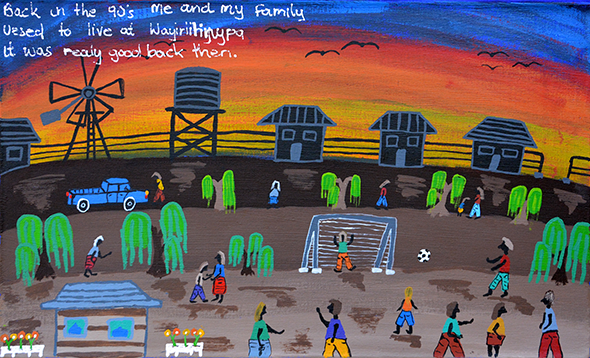 Artist Cherylyn Napangardi Granites also employs a Naive art style to share her memories and stories of the Country around Yuendumu. 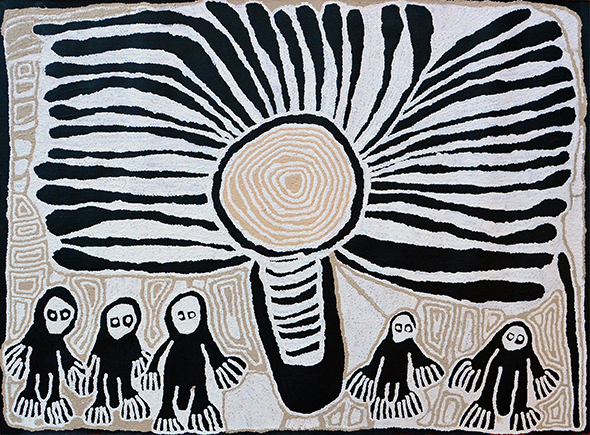 Other Naïve Aboriginal art, and works of great charm and presence, are produced by a group of artists whose mobility is limited by disability, and who have been cut off from the homelands that mean so much to them as Aboriginal people. Aboriginal people are as one with their land – it is a part of them in ways that few westerners can comprehend, and to be separated from one's homeland is a dire situation. These works are multi-dimensional, being innocent, colourful and somewhat childlike images, but simultaneously expressing such a longing and palpable sadness that they are quite extraordinary.